Twyford (VB094) is a largish parish just south of Winchester on the B3338 and east from bank of the River Itchen. Winchester is 3 miles to the north. The M3 crosses the north-west part of the parish cutting through Twyford Down. The original name meant two fords that crossed the River Itchen where over the years several water mills have operated. As well as the village school, two private schools have been in the village with one still providing education. Hazeley Down had an Army camp during WWI. In the mid Victorian period there were 6 inns and beer houses around the village. The YOUNG family was one of the ancient parish families with over 200 baptisms between 1629 and 1874. Other local families were SMYTHE or SMITH, FROST, ROGERS and MARSH. 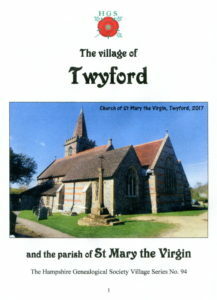 This twelve page booklet includes a great deal of historical information covering Twyford including not only the gentry but also the teachers, publicans and ordinary people. To assist with your research, useful references for Twyford documents and records held at the Hampshire Record Office are given throughout, together with other sources and website addresses for more information.